Wow! Time flies. It's been four months since my husband and I took our couple's getaway to Highlands, N.C. where we stayed at the Old Edwards Inn. 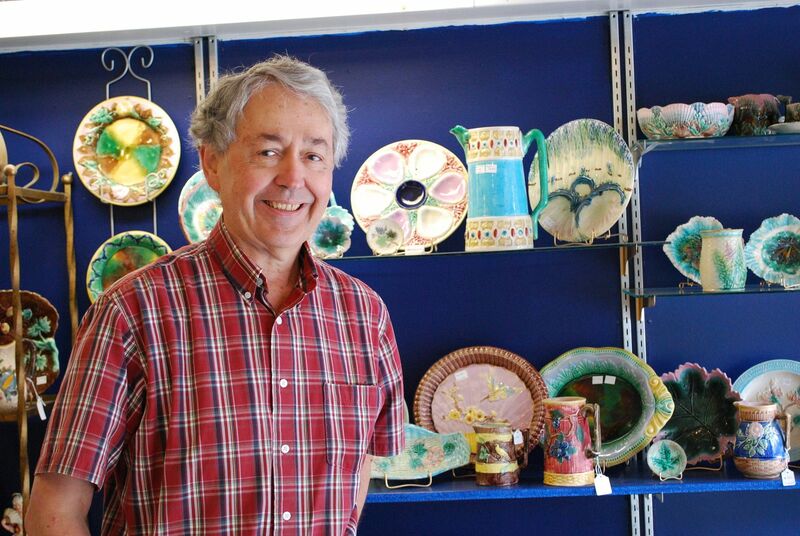 If you recall, I promised to post about my visit to a local antique shop in Highlands where I met the cutest man who gave me an impromptu lesson on Majolica. So, why the fascination with Majolica? Well, I've seen bits and pieces of it my entire adult life. When I was single, practicing law in Atlanta, I would go to Scott's antique market as a fun Saturday outing with friends. There was a girl in our group who was totally crazy about Imari (which is an entirely separate post). But, during our trips she would search endlessly for Imari. 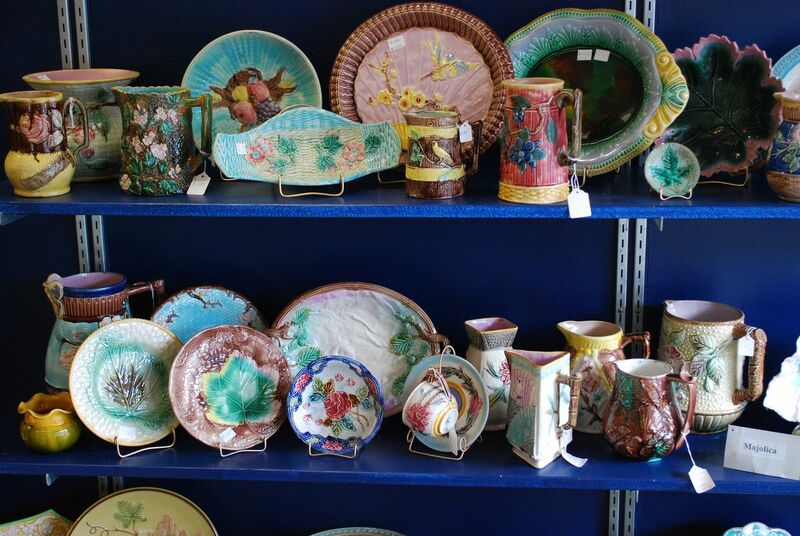 When you are standing before booths full of china, you see a lot of Majolica! 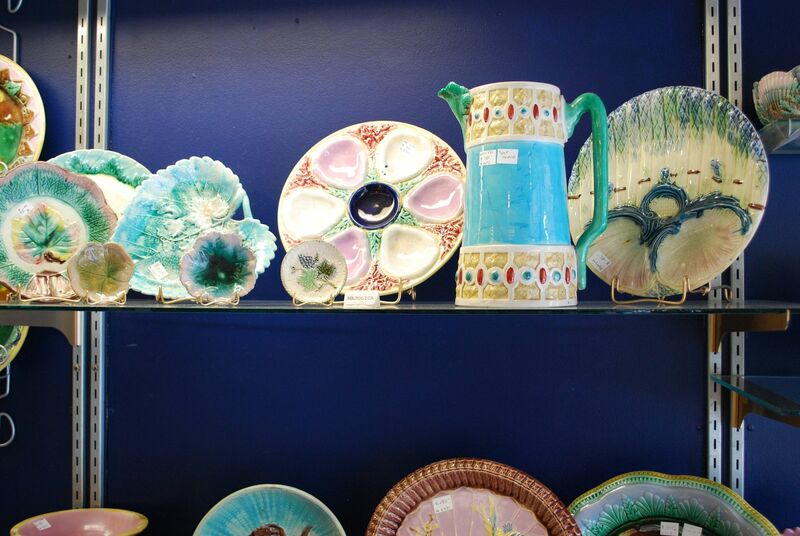 Fast forward a decade - I began working with a client who owns an extensive collection of Majolica. 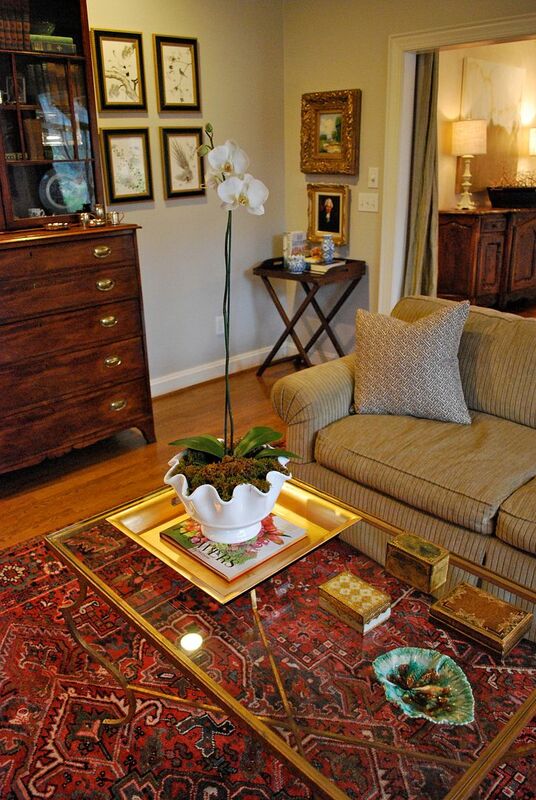 She has a beautiful English country style, and needs no additional furnishings. I would come in to simply restyle her things for a fresh new look. Since that first re-design, I've returned several times to provide seasonal styling/fluffing for her beautiful home. You can see more of her space in my portfolio. During that first visit to her home, my mind immediately jumped to those days at Scott's market. So much so, I had to have a small piece of my very own! One missing link to the puzzle for me in the whole Majolica thing - Why is Majolica, which originated in Spain on the island of Majorca, then produced extensively in Italy, associated with the English Country style in my mind? There is something about majolica that truly feels like the mountains to me. No, not like the carved wooden bears and pinecones you see when you go skiing in Colorado. This is a more refined, mountain feeling like some of the affluent mountain communities in North Carolina done in the English country style. These homes always include Majolica and the pottery blends seamlessly with English country furnishings. So, what's the connection? 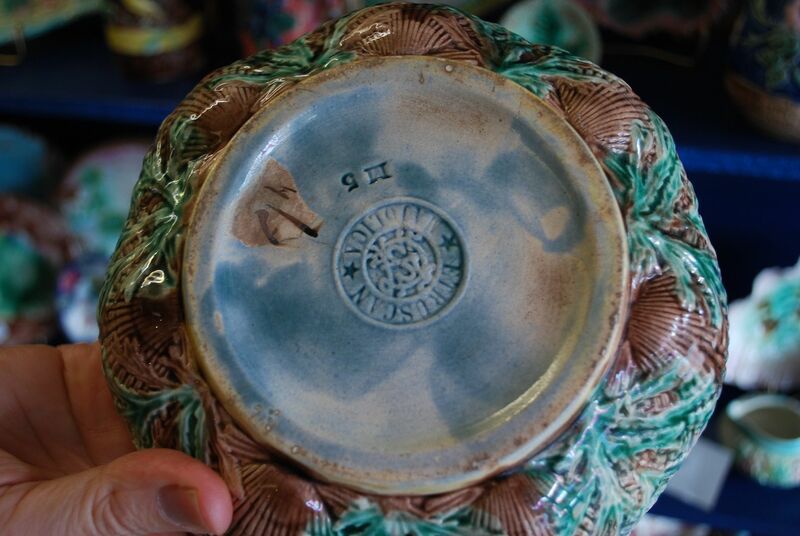 Apparently, in 1851 a Englishman by the name of Minton created something called Palissy ware majolica which was a blend of traditional majolica and the creations of the 16th century potter, Bernard Palissy who was known for is plant and animal motifs. Minton called this pottery Pallisy ware majolica because his glazing technique was different from the original majolica seen in Italy and Spain. However, over time, the "Pallisy ware" was dropped and the public simply called it all majolica. Thus, the public embraced this Englishman and began to include his pottery in their homes. I'm guessing it was very modern to see this in English homes when it first came on the scene. Sort of like seeing a piece of modern artwork mixed in with traditional furnishings. Funny to think of Majolica as trendy! So, suffice it to say, majolica includes a very large array of pottery with all sorts of nuances and changes that have been made to the glazing techniques, motifs, and styles by manufacturers in many different countries. When I began drafting this post, I felt as though I had opened a can of worms. 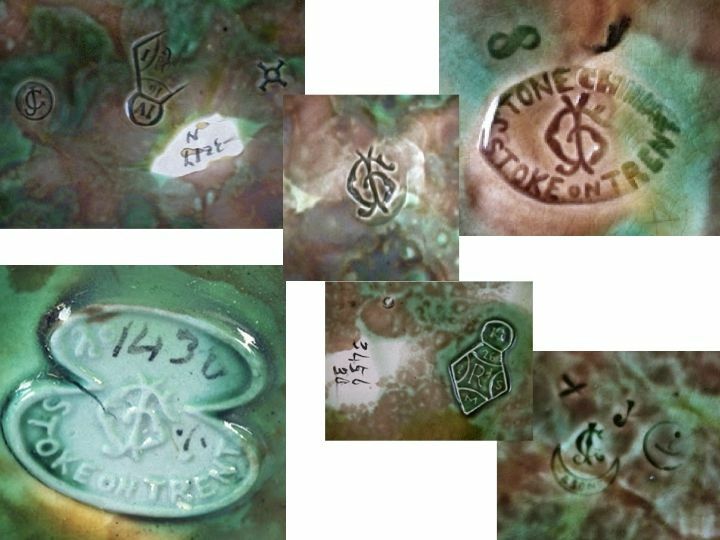 There are individuals (historians really) who have devoted their entire careers to this pottery - extensive books written on it. So, this post is by no means the "go to" on valuing this beautiful pottery. Instead, consider it a tiny introduction to a beautiful pottery that could be included in your home. 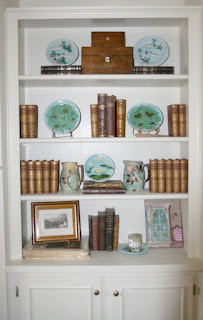 Here are just a few simple tips anyone can implement when discerning antique majolica. Tip One - Check for markings. This is the easiest thing to do with any porcelain. Just remember, not all Majolica is old/antique. The three major producers of Majolica are Minton, Wedgewood and George Jones. 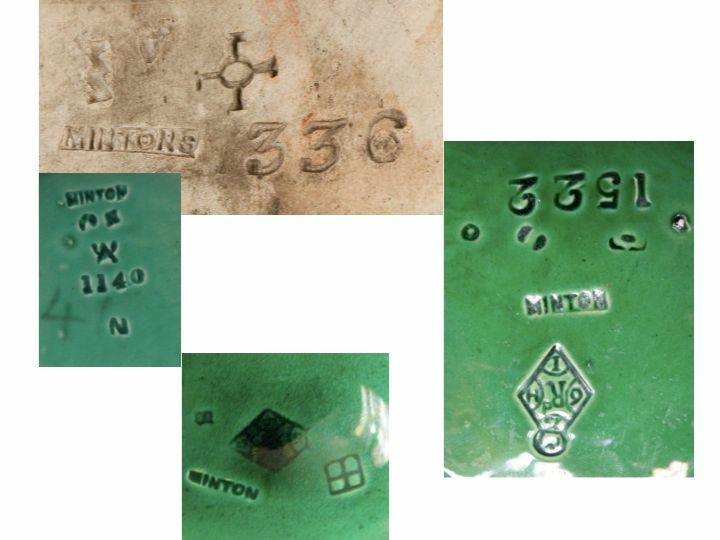 Of the three, George Jones is the most difficult to determine as the markings changed over the years. However, there are many other less prominent producers with markings that are also authentic. But, if you see any of these markings, you are dealing with the real deal. Tip One - Always ask what circa is it? This question is very different from "Is it old?" Old has so many interpretations - for example, the 60's are considered old for someone who was born in the 70's or later! So, be more specific if you want to know how much age a piece has on it. Tip Two - Let the weight be your guide. I think this is the best tip of all. During my lesson with the shop keeper, he handed me one antique piece and one new piece and the weight of the two was significantly different. The older piece was thick and heavy while the new piece felt thin and refined like china you would see being made today. Tip Three - Buy what you like. There are so many different styles of this pottery that you are sure to find a motif you like. My favorite is the begonia leaf plates with all the colors. But if you are looking for something more subtle, there is a solid green that is lovely and would totally work in a neutral space. Sanded majolica is also popular. Like anything, if you become interested in collecting this pottery on a larger scale, do your research. 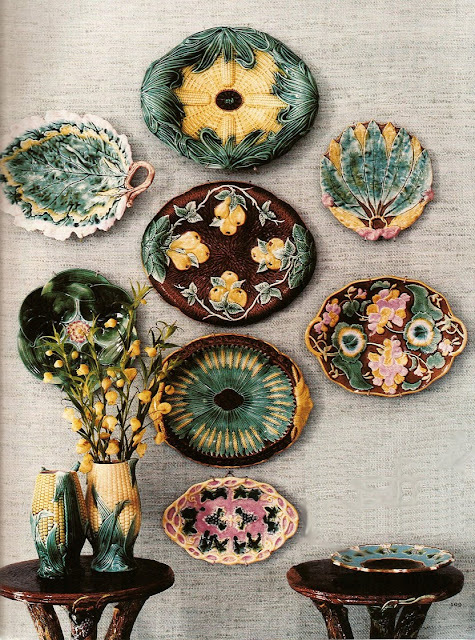 There are entire books devoted to antique majolica. Happy Weekend! M.
Wow, this is really interesting Mandi. My grandfather (my Mom's father) was an auctioneer so my Mom knows a lot about everything. I'll have to send her your post to see if she is familiar with this. 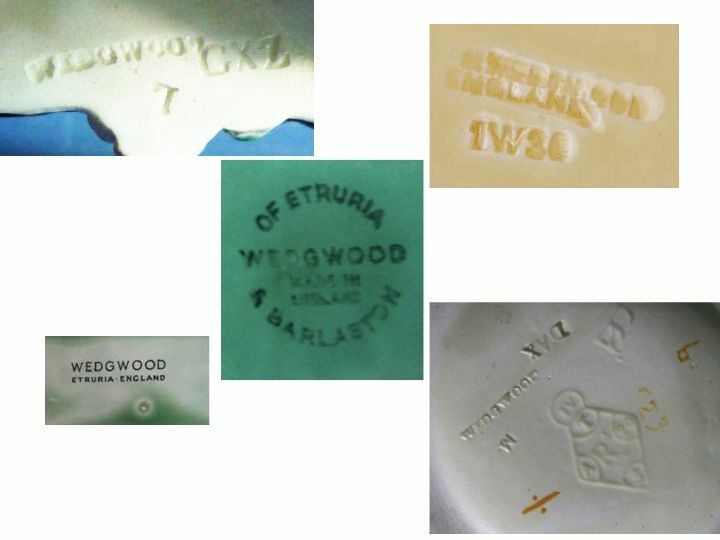 I didn't know Wedgewood made Majolica and that it's amazing how many variations there are of Majolica. 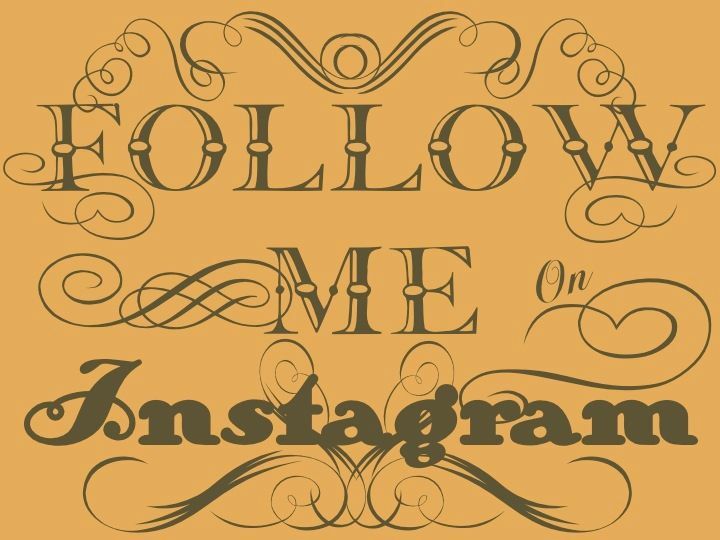 Thanks for the post on this and have a great weekend! So valuable and interesting. I didn't know this, great information. Thank you! Interesting... I just unpacked a box of my grandmother's odds and ends and there is a small piece of Wedgewood Majolica in there. Think I'll hang on to it. :) Thanks for sharing, Mandi! So glad you did this post....now I will know how to check for the real deal! How interesting. Antique shopping is so much more fun when you know something about what you are looking at. I consider myself educated now! would like to follow your best interior design. I remember about 15 years ago buying some at Scott's .....still have in a box somewhere! Thanks for the lesson!